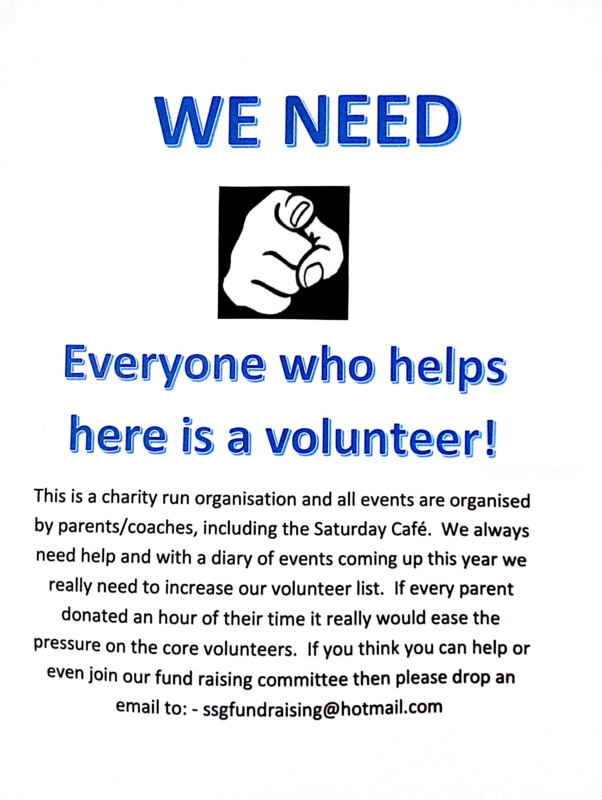 The Cafe is run by volunteers and the money raised goes to new equipment and maintenance of the gym. We need more help for the Café to run smoothly every week. If you would like to help with the smooth running of the Café, please contact us at SSGFUNDRAISING@HOTMAIL.COM or speak to us on the day. This entry was posted in Club Information on 18/10/2017 by Kerry Reynolds. This entry was posted in Club Information, Our Club on 08/03/2016 by Kerry Reynolds. This entry was posted in News on 25/02/2016 by Kerry Reynolds. Fees are paid – TERMLY IN ADVANCE – and are non-refundable. The amount is determined by the number of hours each gymnast attends. Fees are paid in advance before the end of term to reserve your child/children’s/YOUR place for the next term. Included within the fees: – SSG Club Membership; occasional Newsletters; (children only) 1 competition entry for SSG Annual Club Competition, which includes 1 free raffle ticket per entrant. This compulsory fee is paid annually and covers the period 1st October – 30th September, this year’s rates are £17.00 for non-competitive gymnasts and £41.00 for *Competitive gymnasts. Preschool Insurance is £11.00. SSG sends your full insurance payment to British Gymnastics Head Office in Lilleshall. For any issues with renewing or joining BG membership, please contact them direct. (All insurance for 2018/19 remains at last year’s rates). Last sessions of the year are on Friday 14th December. First sessions of 2019 are on Monday 7th January. Unless the coach informs you otherwise, we do not stop for half terms. The recreational side of the club (once/twice a week gymnasts) stop for a summer break as per the school holidays. However, some gymnasts may be offered extra sessions at the coach’s discretion. PLEASE DO NOT PUT PRESSURE ON YOUR CHILD’S COACH, REMEMBER THEY ARE ALL VOLUNTEERS. This entry was posted in Club Information on 01/12/2015 by Kerry Reynolds.